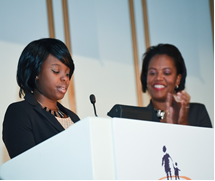 Hosted annually, Diamonds of Dorchester is the Center’s signature fundraiser which supports our entire community and nearly 600 families served through our programs and services. State Street’s Joseph (Jay) L. Hooley, Katherine A. Hesse, Esq., Chair, and Deirdre Houtmeyers, President. 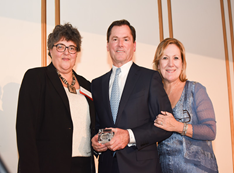 Last year, St. Mary’s Center honored State Street Corporation and Joseph (Jay) L. Hooley, President, CEO, and Chairman at the 11th annual event on November 12, 2014 at the Fairmont Copley Plaza, with the John M. Corcoran Award for Excellence. There were many highlights, including a moving tribute to the late Mayor Thomas M. Menino. A very remarkable and inspiring young mom bravely shared her story and details about the support she received while living at St. Mary’s Home with her young daughter, participating in the GRLZradio.org program, and earning her high school degree through the Women’s Learning Center. Guest speaker from GRLZradio.org, St. Mary’s Home, and Women’s Learning Center with Senator Linda Dorcena Forry. “For almost two years, I have been at St. Mary’s Center. My entire life has changed…To this day, I try not to imagine where I would be if I hadn’t stayed at St. Mary’s Center. Thank you to our guests and sponsors, along with our emcee Senator Linda Dorcena Forry and Boston City Councilor Tito Jackson, who served as our auctioneer. Together, you raised more than $380,000, so that more families may receive shelter, clinical and educational services, job training, employment placement, and search for affordable permanent housing at St. Mary’s Center.